After a tornado struck Joplin, MO two years ago this month workers from this area went to lend a hand. Two young families soon found themselves called to do something bigger. They led the efforts to "adopt" a family, raise the funds and build a home. Volunteers from Hancock, Henderson, Warren and McDonough Counties made many trips to Joplin, some 22 area churches gave generously and fundraisers were held. In a little over two months a home was built, dedicated and given to Stephanie Dalton and her three children. This inspiring young widow and her children developed a close relationship with the volunteers and a deep appreciation for the many others who donated so generously to help a family they'd never met. 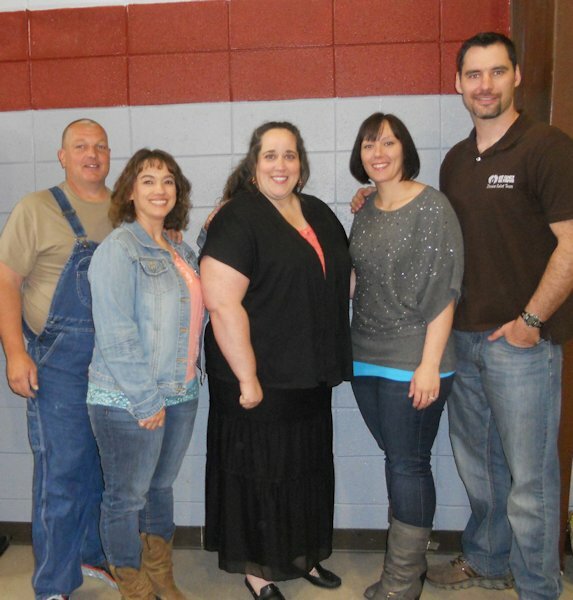 This weekend the Dalton family was able to come to the area and meet some of those people. They attended La Harpe Christian Church, spoke briefly during worship expressing their gratitude and had a chance to visit at a potluck dinner at noon. Roy Day and Ryan Johnson had little idea what lay ahead for them when they made their first trip to Joplin. In the time since that first trip they have formed a non-profit group, "One Family, One Purpose", and have built a house for a family who lost their home in the Thurman, IA tornado last spring. Now their attention is turned toward Moore, OK and the disaster there. A group will be going there later this week to help and possibly determine what the next step might be.